We recently received some feedback from a Bread Boss user who expressed dismay at the plethora of sourdough terms used all around the English speaking world. This included books, videos and websites. It’s all very confusing and makes it hard to understand. Bread Boss seemed like just another one to add to the pile of mishmash. It occurred to us this may be a timely post and others may also find this interesting and informative. The author of the email kindly allowed me to reproduce the relevant part as the basis of this post. Here’s an excerpt from the email. My reply isn’t meant to be an exhaustive recount but a brief outline of the history of the problem and why Bread Boss and this site uses the sourdough terms it does. We also at times lament the inconsistency or mistaken use of some terms interchangeably. When it comes to the bakers lexicon regarding sourdough it’s confused not only here in Australia but all over the world excepting perhaps Germany. Germany’s sourdough tradition and baking technical terms are fairly well developed. Although, it is probably to be expected in Australia, Britain and the US as not all the newcomers to baking bread have a technical or historical foundation in bread making. Add to that the co-opting terms from other languages into English. In Australia, where we haven’t had a tradition of sourdough baking as such, because at the time when sourdough was the favoured technology, Australia was still only an early set of loose English colonies. For historical reasons Australia adopted its baking traditions from the English/British parent. Hence we are ‘confused’ in our sourdough baking lexicon as we’ve brought terms from other lands and languages without knowing how they are to be applied. Back to the newcomers, thinking chefs rightly questioned the state of bread in Australia. It was not unknown for our conventional white bread to be referred to as “white death”. Chefs entered the realm of baking because, in the main, bread baking became “process” driven. Much like the rest of the world, baking bread became the domain of ‘process manufacturers,’ to the detriment of bread integrity. It seems they forgot bread is food! 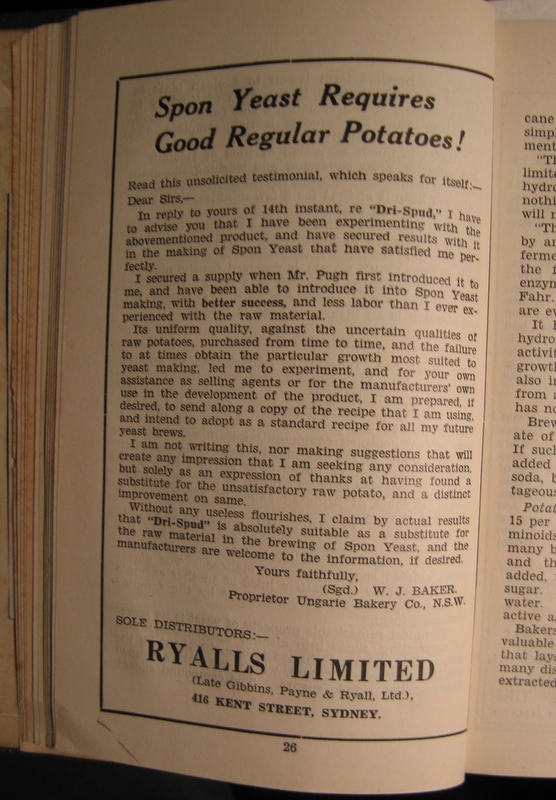 Flavour, texture and nutritional character was less important than it’s ‘refined’ appearance and ease of manufacture. Bread morphed into a cheap mass produced filler with little or no flavour, variety or nutrition. These Australian chefs have by and large taken their lead from high profile US chefs and self taught bakers who have gained a high profile or celebrity status through their excellently illustrated photographic books on baking. Many of them have popularised terms that have little historical basis or are a misapplication of existing nomenclature. The upshot for Bread Boss is that in the end we had to decide on a single lexicon with consistency. I might add this problem plagues me no end as I try to teach each new generation of bakers who come to me, a consistent baking jargon regarding sourdough. Let me attempt to explain in brief. For instance the French word “levain” where we get the middle English word “leaven” – incidentally it’s not used much these days – is derived from the Latin, ‘levamen’ meaning “alleviation” or “mitigation”. In English leaven means – that portion of fermented dough carried over to ferment/aerate subsequent bread doughs. Leaven fell out of use with the advent of barms and later with the wide acceptance of commercial bakers yeast. In the English baking world it became fashionable to prefer bread that lacked the acidic ‘twang’ characteristic of sourdough. Sourdough was seen as ‘rural’ and less gentrified. This trend began initially in Vienna as the Austrian Hungarian Monarchy patronised highly refined white bread. Sieving milled flour was pursued and in fact steel roller milling was invented in Hungary. Not only was this the case, in Hungary proper the area known as the Danubian or Panonian basin was well suited to growing hard high protein white wheat which was milled between steel rollers and used in the production of white “vienna” bread. It was a highly refined white bread leavened with barm grown from brewers yeasts. The lack of acid and the roller milled sieved flour also allowed greater bread volume so the beginnings of soft white bread was born. This refinement was seen as progress in England and the use of leaven faded as the use of barms became the norm. Of course this was also patronised to a greater or lesser extent in other European courts as no monarchy wanted to be seen as less progressive or less refined. Incidentally, since we are at it, I made the point that bread barms were used as a way to encourage yeast activity and growth but limiting acidity. Barms could be easily and practically introduced into bread doughs as they were made in the bakery using various methods such as scalded potato mash or scalded flour and water brews. It goes without saying there were several types of barms and each baker found his own special barm formula and method that suited the specific bakery environment. In Australia barms were often named “spons” and there were several well known types/methods. “Spon” was a shortening of the word “spontaneous” and referred to the fact that yeast activity seemed to arise naturally and without cause. 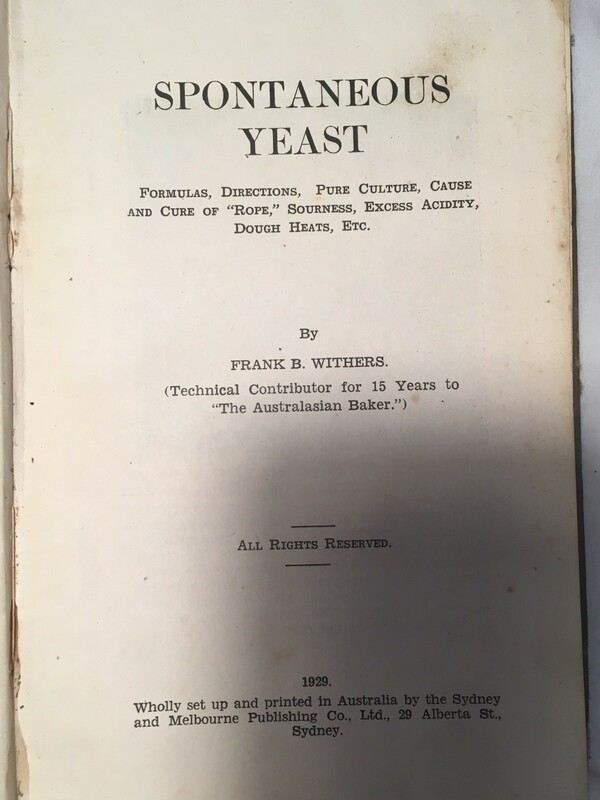 See Spontaneous Yeast, 1929 written by Frank B Withers. Withers goes to much length to document many spon/barm recipes that were used in Australia. While we applaud self taught bakers, even the celebrity ones, some have used barm or yeasted pre-ferment terms such as, poolish, by misapplying them to sourdough. These misapplications have not only confused new comers but younger professionals too. Back to using French words; of course using the French word for sourdough to these celebrity chefs seemed a no-brainer as it enhances the “theatre” aspect of baking that celebrity chefs/bakers trade in. It creates a mystique in the English world where there really isn’t any. The word “sourdough” is a relatively new term for bakers of the English language and is a direct and literal translation of the German word ‘sauerteig’. Sauer = acid – teig = dough. However, in older English, foods that were fermented were said to ‘sour’, hence it could also have been used in that way. Nevertheless, Germany has a long history of sourdough baking as acid production is very important to improving the baking ability/quality of rye flour. Rye is still a very significant part of the baking industry in Germanic countries. Although commercial yeast has made significant inroads for quick dough gassing, sourdough as the way to introduce acid for flavour and limiting starch degradation in bread doughs with a significant portion of rye flour is still used. The detail and history of sourdough in western countries is long and sometimes a torturous tale but it has always been interesting. During the development of Bread Boss, Kon and I, thought about the terms we should use. Some of them took a bit of time for us to be content with. We wanted to retain as many technical terms as we could – excepting the misused ones – since we knew technical terms were largely precise and at least known on internet searches. For instance internet searches would yield at least some useful results. However, when it came to some of the terms for sourdough and starter it was fast becoming difficult to know if home-bakers, chefs and professional bakers would recognise some terms. As part of the quest for clarification which started prior to the inception of Bread Boss, I initiated an online discussion with John Downes, whom I admired as Australia’s sourdough grandfather. Of course others participated also and the aim was to develop agreed useful definitions and terms for sourdough, sourdough fermentation and sourdough bread. It was an attempt to create a basic framework for defining sourdough and sourdough bread as a set of standards. We were hoping it may be adopted by an industry association as part of a push back to the tendency for the sourdough label to be used and misused in the market place to approve “fake” sourdough. We finally forged this table below but not without objectors. However, the frustrating thing was that there was little or no interest from professional bakers or associations to make this progress and take it further. Inoculating culture "Starter" A small portion of mature sourdough used to inoculate or "start" a larger batch of flour and water referred to as "sourdough or leaven". At maturity the original weight of "starter" is retained to inoculate or start another batch of sourdough or leaven, hence it is not included in the yield calculations. Inoculating dough "Sourdough leaven" A portion of the total bread dough flour weight inoculated by a starter to form a mature dough of endemic flora - including but not limited to: a poly-culture of lactobacillus, and endemic yeasts - used to aerate and produce bread dough maturity. Sourdough leaven can be a single stage fermentation or multiple stage fermentation to maturity. Bread dough "Sourdough Leaven Bread dough" A dough containing all the final ingredients, including but not limited to: sourdough leaven, this dough is used as the final bread dough in the bread making process. This dough is baked to form bread. fermentation Sourdough leaven fermentation The process of fermenting sourdough leaven is initiated by a poly-culture in a natural symbiosis of endemic origin. Typically a mix of lactobacillus and sourdough leaven yeasts. Commercially cultivated bakers yeast strains are not deemed typical nor included. The product Sourdough Leaven Bread Bread of sourdough leaven; does not include any other fermentation other than the endemic poly-culture of sourdough leaven from the first to the final stage until entry into the oven. I accept that we will not change the world, nor should that be important, but at least for the purpose of intellectual clarity it makes sense to have a systematic lexicon with clear definitions. We hope that makes it a bit clearer why we chose the terms we did for Bread Boss and why there are so many different terms that are muddled. For us at Bread Boss technical clarity is regarded as the philosophers stone. Thanks for the feedback, Les. As an inexperienced home baker trying to improve my efforts at sourdough bread baking and having read much information in various forms, I too find your detailed reply very interesting, thank you for taking the time to keep Bread boss users such as myself informed.